I love Kodi. (This is just an evolution of my love for XBMC, since it's the same thing with a new name.) In fact, although I've expressed my love for Plex over and over (and over) the past few years, I still use Kodi as my main interface for the televisions in my house. We gave Plex a try as our main media center software when it was released for TiVo, but after several months, we found its interface to be cumbersome and the transcoding for local media frustrating. So during the holidays, I once again installed Kodi on Raspberry Pi devices around my house. Using OpenELEC, the installation process itself is painless. Heck, even centralizing the library database was painless. The frustrating part was getting 5.1 surround sound to work. 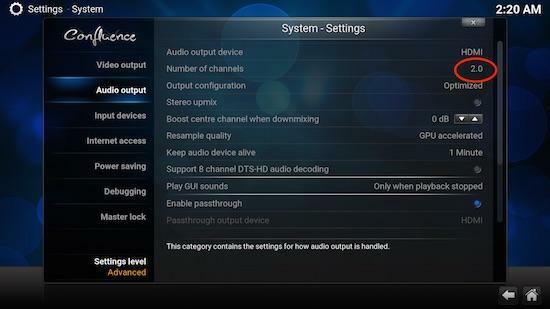 The problem is that when Kodi is set to 5.1 audio output, the center channel is missing! There's a bit of disagreement as to whether it's a bug in Kodi/OpenELEC or just a result of optical audio supporting only two channels of audio. (If that seems odd to you, it was to me too. But apparently, it supports only two channels, which contain all the surround information, or something like that.) The non-intuitive solution is to force Kodi to 2.0 audio. Although it doesn't seem to make sense, I can vouch for it working. Kodi sends the audio as 2.0 stereo, which is transferred over optical (or HDMI, whatever you're using), and then the receiver decodes the surround information from that two-channel signal. The tl;dr version is that Kodi will send the surround sound information over two-channel audio, so if you are missing your center channel, try switching to 2.0 audio.